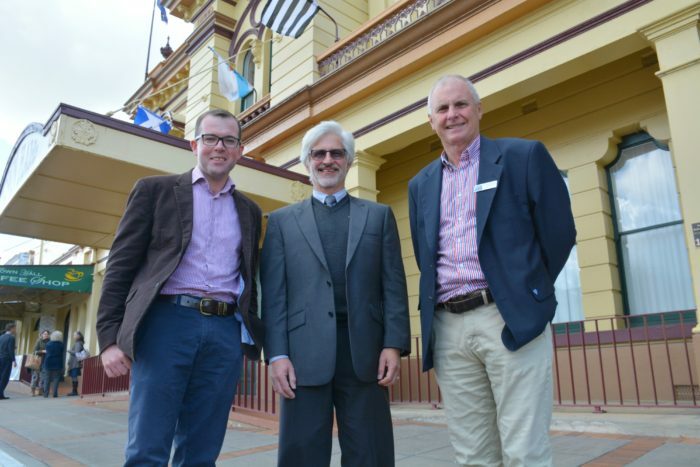 Member for Northern Tablelands Adam Marshall, left, joins Glen Innes Severn Council General Manager Hein Basson and Director of Development Graham Price in front of the historic Town Hall. THE preservation of Glen Innes’ historic buildings has received a boost today, with Northern Tablelands MP Adam Marshall announcing that the NSW Government will provide funding to help Glen Innes Severn Council conserve the town’s heritage. Mr Marshall said council would use the $28,000 heritage funding package to fund a local heritage advisory service and target local heritage places in the Highlands town. “Glen Innes has a rich history, dominated by agriculture, which has left it with a multitude of beautiful heritage buildings, each with a story to tell,” Mr Marshall said. “This funding provides a two-pronged approach to preserving Glen Innes’ unique history – with money to protect existing heritage buildings and funding to provide an advisor that will help locals understand rules that may impact them. “Our region’s heritage is often irreparably damaged because individuals simply aren’t aware of their legal obligations and options when dealing with older buildings. “A heritage advisor will visit Inverell on one day a month for the next two years, assessing building applications, visiting sites and providing advice for owners and builders. The funding is a continuation of the NSW Government’s commitment to preserving heritage – with more than $5 million allocated for heritage places and advisors across the state. “I congratulate Glen Innes Severn Council on securing these funds and its commitment to preserving the town’s unique history,” Mr Marshall said. Appointments with the Glen Innes heritage advisor can be on the first Tuesday of every month via council on 6730 2350.